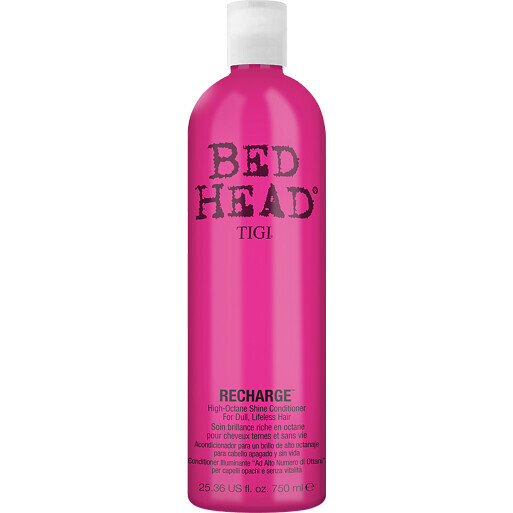 Transform your hair from dull to dazzling with the Tigi Bed Head Recharge Conditioner, a vitamin-rich formula that supercharges your shine. When hair is limp and lacklustre, this sumptuous conditioner will help to repair, smooth and reinvigorate it. Its antioxidant-rich formula helps to replenish the health of your tresses, whilst shielding them against the damaging effects of UV rays and heat damage. At the heart of the formula is a blend of lactic acid to repair hair, panthenol to add body and shine, and sunflower seed oil for natural thermal protection. Added acai fruit extract helps to reduce cuticle loss and split ends. Work through mid-lengths to ends after cleansing with the Recharge Shampoo. Rinse thoroughly.